If Germans are wearing suspenders with their traditional costume, that is not always because they are dealing with a pair of slipping Lederhosen. Even if the pants fit like a glove, both ladies and gents like to wear Lederhosen braces because it just looks great! 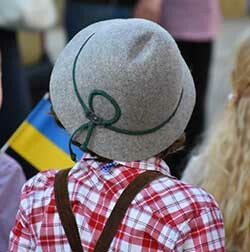 In the huge assortment of Dirndl.com, everyone will find the right suspenders for their Oktoberfest costume. There are many specific reasons why you could be looking for German suspenders for your costume. Maybe you're just looking for an accessory to really round off your Oktoberfest outfit. Maybe you are actually struggling with slipping Lederhosen or other Trachten pants for men. 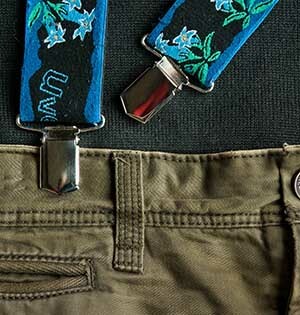 In both cases, our high-quality suspenders with quaint designs are just right for you! These accessories do not only fulfill functional, but also visual purposes in Trachten fashion: They round off your costume, make it appealing and give your outfit an individual touch. On the color level our rustic Lederhosen suspenders are available in tones like fir green, olive, blue and red. They are designed in a Y-shape and decorated with typical motifs. These are, for example, edelweiss flowers and hunting motifs. The latter present deer and horns which as motifs are not always just printed, but also embroidered. In addition to all the traditional optical advantages, all Lederhosen suspenders for men and women have something very crucial and indispensable: the clamps. Made of metal and mostly gleaming silver, these components ensure that you can securely attach suspenders to your pants. Just clip them on and the suspenders will secure the fit of the traditional pair of trousers. Please make sure that your pants do not already have their own straps. This would make the use of costumes suspenders superfluous. Braces replace costumes without straps and traditional belts, because all these fashionable highlights have the same function: they are to ensure that the waistband sits at the desired waist height. If you do not likethe look of Dirndl.com suspenders, you can take advantage of the 100% money back guarantee and, if you wish, order a different model or use a traditional belt for a similar effect. Jackets and vests, of course, can hide your chic new suspenders. But let's be honest: At the latest when dancing in the marquee, you will drop the jacket and be happy to show off your stylish suspenders!